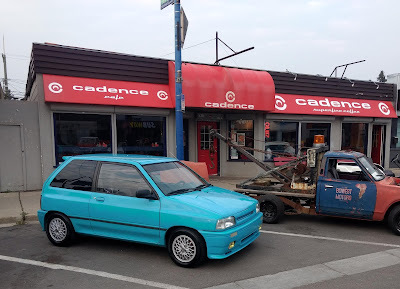 In my first econobox to hot hatch evolution post I featured the Renault 5 and its Turbo and Turbo2 variants. One of my favorite YouTube channels is Jay Leno's Garage and his April 22nd post featured the same car so I thought I'd share that video for your enjoyment. We'd love to hear from you. 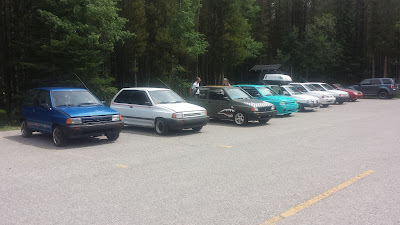 What would you suggest for another econobox to hot hatch evolution post? See you next week! When econoboxes evolve into hot hatches... part 2. For this post we'll return to North America and have a look at the Dodge Omni/Plymouth Horizon twins from Chrysler Corp. 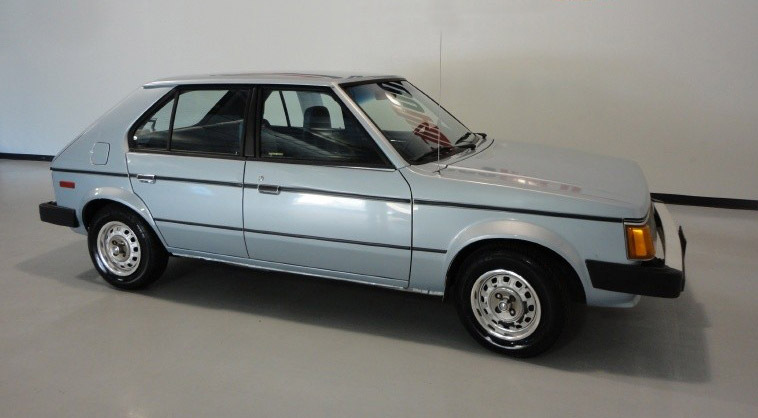 Introduced in 1978 the Omni/Horizon was a five door subcompact produced in Belvedere, Illinois. 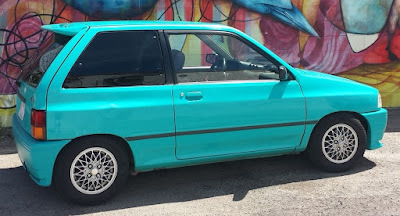 Loosely based on the European Simca Horizon this hatchback was the first North American built front wheel drive vehicle to sell in large numbers. The focus of this blog has been econoboxes, regular run of the mill vehicles that got you from 'A' to 'B' in reasonable comfort while consuming as little fuel as possible. However, some manufacturers, and the car community in general, chose to take things to the next level and turn these vehicles into hot hatches! 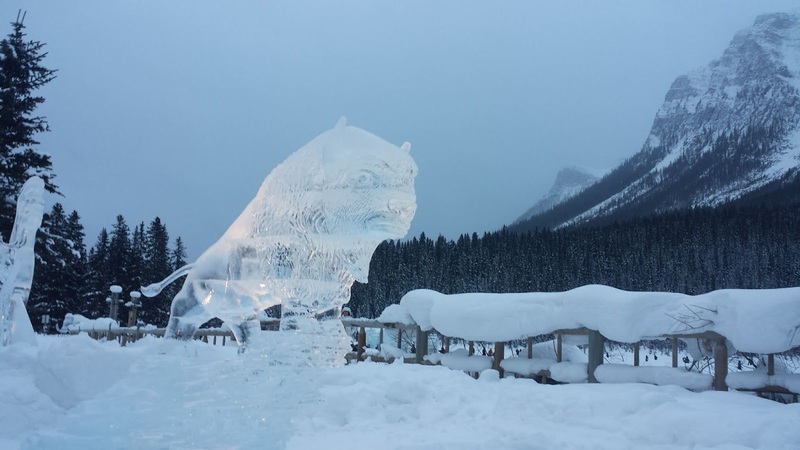 There's lot of fun winter things to do in our area... skating on an outdoor rink or pond, cross country skiing across a frozen lake, downhill skiing at a nearby mountain park, tobogganing. Some of these activities are within walking distance of the house but others require driving. Winter driving as a whole doesn't bother me but there are a few things about it that do; noisy tires, increased fuel consumption and dirty cars. There's parts from how many cars???! The manager at my local AutoValue store calls our car "Frank" as in Frankenstein.... perhaps he's got good reason to! 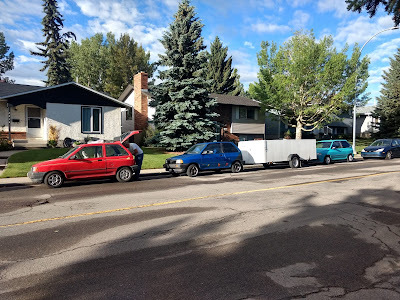 Let me explain: in the years we've owned a Festiva (we purchased our first one in 2001) we've done a lot of work on the car and since there is next to no aftermarket support for it we've had to improvise and source items to adapt and modify. The Festiva community, particularly the forum at www.fordfestiva.com and more recently the Ford Festiva.com Facebook group, has been a very creative one. Not only creative but willing to share those ideas and discoveries. What makes our Festiva different? The biggest change is in the engine compartment. Saturday morning dawned cool and showery so I was a little worried about the weather. But by the time we left the house to make our way to the venue the sky was well on its way to clearing and the temperature was rising. Two of the attendees, Bob from Pasco WA and Ryan from the Edmonton arear, had stayed with us on Friday night so we headed out together with an initial stop at a local gas station so that Ryan could fill up. Bob's, Ryan's and my Festiva just getting ready to leave. Yes that is a trailer behind Ryan's car! We were running a little late so I headed off leaving Bob and Ryan to follow at a more leisurely pace. I Hate Replacing Gear Oil. Here are Tips to Make it Less Terrible.